Then it’ll be time to pick up Bittersweet Seasons once again – although I now realise that I don’t have the Mill Hill beads for this one (I really am useless!!!!! ), which means I guess it won’t be a 2010 finish like I’d hoped. Anne S • This entry was posted in Blue Ribbon Designs, Crazy January 2011 Challenge, Cross Stitch, Finishes, Halloween, Heart in Hand Needleart, valentines, Works in Progress and tagged Cross Stitch. Bookmark the permalink. Great finishes Anne. You’ve got some lovely projects lined up for the 15 starts challenge. I’ve stitched the Tiger one, it really is a beauty… so life-like. Sounds like you had a great Christmas, apart from the eight-legged uninvited dinner guest. You wouldn’t have seen me for dust either! Congrats on your finishes! Good luck with the Crazy January challenge. That’s a great variety you have selected. I was just looking at all of your finishes on the Worlds Largest Collection of Smalls blog, and then came to your blog here from there, and wanted to tell you that your stitching and finishing are beautiful! Wow, you have set a challenge for yourself indeed! I’m choosing relatively small designs for the challenge. I know myself, hee hee! 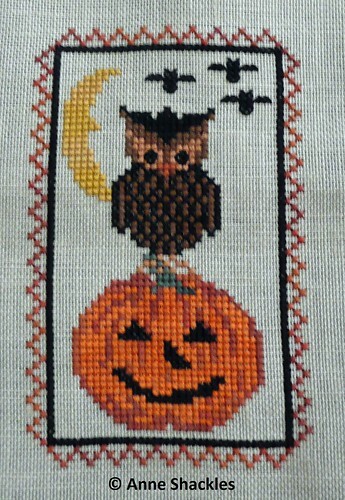 Your finishes are adorable, and now I’m in the mood to stitch something non-Christmas, although I still have to finish up one little Christmas ornie. I’m having a little give-a-way if you’d like to stop by. 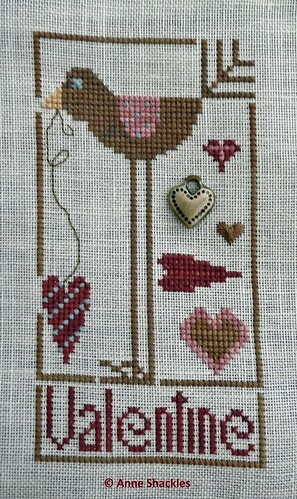 Some St. Valentine’s linen to be raffled on New Year’s Day! Love the Valentine Bird…so cute! the valentine bird is so lovely!